Yesterday, I baked our first loaves of bread in the new oven. My fears— or concerns, if you will—turned out to be completely justified. In my old oven, it took thirty-three minutes to bake the bread to golden perfection. I decided to see if the same was true for my new oven. It was not. 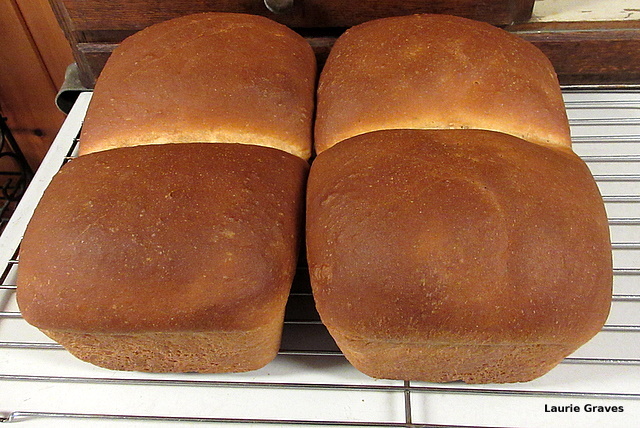 The bread, although not burnt, came out a little too dark, a little overbaked, and thus a little dry. As Clif and I mostly think of bread as toast—oh, how we love toast—this dry bread is not as bad as it sounds. However, next time I make bread, I will bake it for thirty minutes and go from there. The next challenge will be gingersnaps, which I’ll be making on Monday to bring to my friend Esther when I go for a visit on Tuesday. In my old oven, eleven minutes gave you a perfect cookie that had a little snap and a little chew all at the same time. I’ve decided to try nine minutes. All this fussing about time reminds me that my old oven and I were quite the team. I knew just how long it took to bake family favorites. Now, I will have to recalculate the times for many of the things I bake. No wonder the old stove seemed like a friend. People and their tools, their equipment, and their appliances can form quite a bond. Your new stove has a little bit more juice to it! 😛 You’ll get that hang of it in no time!! Shannon, yes,indeed! It will take a bit of fiddling, though. Hi Laurie. I’m sure you’ll get the hang of your new oven, though it’s true people get very attached to their tools. I am very close with my weed whacker. Jason, I know! People and their tools! Maybe you are in the “trial and error” phase with a new stove, but I could almost smell that bread, and it looks delicious! I come from a long line of bread lovers! Yes indeedy! Thanks, Pearl! It actually wasn’t as dry as I had feared. Eliza, learning curves is right! But I’ll get it eventually. Happy Earth Day, Happy Birthday!